Tina, your work is obviously very organic. How do you describe it? 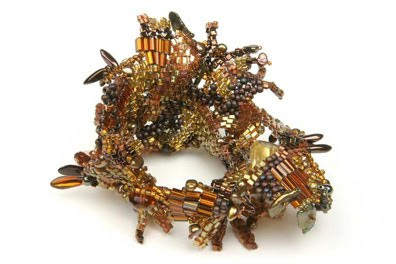 My current focus is on self-supported sculptures using off-loom beadweaving stitches. My work is probably most closely related to contemporary basketry: 3-dimensional forms made from flexible materials. I like to keep an open mind about what constitutes a “bead” (technically, anything that has a hole going through it!). I have a series of sculptures made from pasta, which, as anyone who has strung a macaroni necklace knows, makes excellent beads! My creative process is completely improvisational and intuitive. I never plan or sketch anything – I simply choose some beads, thread a needle and plunge into it. That improvisational process is both the fuel and the outcome of my work. I am as compelled by the challenge of continually asking, “What happens if…?” as I am by the eventual answer, which always surprises me. Ultimately, it is that surprise that motivates me to continue exploring in a way that implementing a planned design never would. I always listen to music while I’m beading, and my favorite is the improvisational jazz piano of Keith Jarrett. I can listen to one of his CDs a hundred times and always hear something new – some tiny nuance I missed previously. I’m completely inspired by his apparent fearlessness in appearing in concert before thousands of people to play music he has never played before. My artistic goal is to be the Keith Jarrett of beadwork! As far as my work habits go, that’s where my background in writing comes in handy. I get up every weekday morning at 5 a.m. and bead for a couple of hours before going to work at my various day jobs (when I was a writer, I wrote every morning before work – different medium, same habit). On my days off, I bead for 4-5 hours in the morning. It’s not really about looking for or waiting for inspiration – it’s about showing up every day and being there when inspiration arrives. Sometimes it arrives, and sometimes it doesn’t, but either way, I get a lot of beading done (almost 1,000 hours a year). So what will be new in your schedule this year? 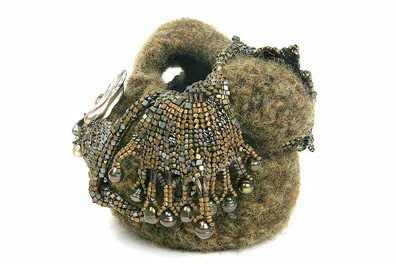 I will be teaching at BeadExpo in Portland, Oregon, March 27-30, 2008. For information, please visit the BeadExpo web site. I also have new kits for class projects, including the Phoenix Pendant and the Peacock Bracelet. All of my class projects are shown on my web site on my class page. And finally, one of my pieces was accepted in the Dairy Barn’s Bead International 2008, an exhibit that will tour various venues through 2010. For more information, visit the Bead International website.